In a perfect world, enough people would be riding bikes that bike lanes would not be needed. But this isn’t a perfect world, it’s Auto World. Riding a bike is fun, healthy, good for the planet, and sometimes dangerous and scary. I don’t want to play up the dangerous and scary part. It’s not that it always is or even mostly is; mostly bike riding is just fun. However, sometimes you have a load of groceries and you are trying to ride under an overpass with no shoulder in the dark and you are nicely lit up but still, people buzz by you… sometimes that gets a little scary. I started my urban riding in Baltimore, so Frederick doesn’t ever unnerve me… except those underpasses. There is a grand city plan to make a wandering path go under Route 15, which will cut through Baker Park. It’s part of a longish, recreational bike path. It will cost, if ever completed, 15 million dollars. They have to build a new tunnel, which is the kicker. Conversely, bike lanes are much more affordable. We can get them constructed with far less money. A couple few grand, actually. A bike lane would be infinitely more practical than a recreational bike path. The path wanders; a great concept to go explore the park. But it doesn’t really go anywhere. It connects two affluent chunks of town. Not two parts of town that need connecting, because most trips in these areas are, by rote, made by car. Where cars go is also where bikes need to go; to work, to the store, out to eat. That means safe east-west and north-south passages for bikers, which in turn, means a few bike lanes. Frederick, for some reason, has super-wide roads. Maybe there was lots of crazy drunken buggy drivers back in the day. City transport planners have already looked into how to make the lanes fit. They do, no problem. We can put them in, and make people safe and secure on the road. The great thing is, if it’s easier to ride to work, there will be less cars on the road. Tons of people who work at Detrick could ride in, if their lives weren’t threatened. I know at least a dozen, off hand, and I don’t even know many people who work there, proportionally speaking. Very few people who live within a few miles of work are carpooling, so loads of one-person cars head down the road everyday and flood into the base. These cars take up quite a bit of road real estate. Traffic. Idling motors. Noise. Put even 1/10th of these people on bikes, and it will be quieter, less congested, less polluted. When you commute by bike, even in the rain, you get to where you are going feeling refreshed, happier even, than when you left the house in the first place. You know that when you head to the store afterward, you can pull right up in front of Giant Eagle, and get the best parking spot ever, 4 feet from the door. You know that when you go downtown to eat, you can do the same thing, and never pay a parking ticket or a meter. It’s good stuff all around. 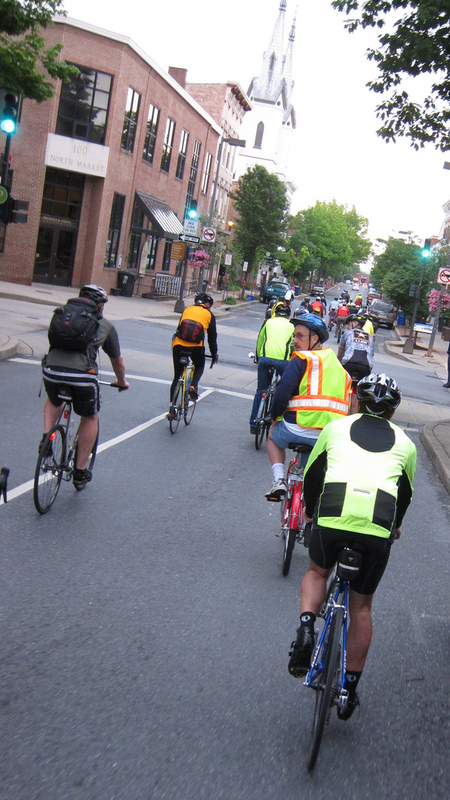 Last year the Frederick Bicycle Coalition helped get the ball rolling in the right direction. We sat down with the mayor and got him to commit to this year’s pilot bike lane on 7th street, which is already installed. Money was pulled from the Mayor’s discretionary fund for this project. This year,he has promised us to extend the bike lane down 7th street, if we can come up with matching funds for the project. It’s going to be a bit of money, but worth it, by our estimate. If the 7th street bike lane is successful, we can go ahead on the Rosemont and East Street lanes. The city council and mayor are all about these things. Money is just tight, which is where the Coalition and you come in. We need help. This isn’t the only project the Coalition is working on, but we think its a major building block; a big thing to point to on our quest to get Bicycle Friendly Community status. People, smart, good people, look at that and think: Frederick looks like a great place to move. See what they are doing on the bicycle access front? So this winter, think about signing up and helping out. It’s pretty easy, and we promise your money is going to a good cause. In fact, after we cover our insurance and website, every dime goes to a good local project. 12 bucks for a shirt. We have them at Bike Doctor, Tom has them at the Escape. On the 3rd of January the FBC is having a fundraiser at Brewer’s Alley, in downtown Frederick. It’s an easy one to get behind, because you don’t need to do anything but eat good food and have a few beverages. 20% of the check goes to the Coalition automatically. Easy, right? It’s all day, so go for lunch, happy hour, dinner, and after dinner drinks… Pick up a T shirt from us, or a bottle. We’ll be there almost all day, just hanging out in the lobby. We’re hosting a 2nd Christmas Lights Ride this Friday, 8:30 at the bell tower. Some folks missed it last time. This low key, nothing happening afterward. Come, if you have nothing going on or wanna avoid Aunt Stella and her Anise Chewing Gum breath. Bundle up. Bring the most ridiculous bike you have and decorate it accordingly. Lights on all sides are strongly encouraged. 9 miles. Very slow pace. Bring the kids. Leave the Scrooges/Grinches. Tuesday: probably nothing, with the Holiday thing. Thursday: 7 am road ride from 7th street Starbucks. 40ish miles, back before 12.